Two games against the Astros, two blown late-inning leads. The lead disappeared in the seventh and Houston took the lead in the eighth in both games. How annoying. Even more annoying is the way the Yankees screw up the most basic stuff each game. Every game there’s an dopey error or a bad baserunning decision. Every single game. Another warm and sunny day in Houston, and the Minute Maid Park roof is open. Tonight’s first pitch is scheduled for 7:40pm ET and you can watch on the YES Network locally and MLB Network nationally. Enjoy the ballgame. Injury Updates: CC Sabathia (knee, heart) will start Saturday’s game. That is the first day he is eligible to be activated off the injured list … Giancarlo Stanton (biceps) has started taking swings now that his ten-day shutdown period is over … Aaron Hicks (back) has started swinging a bat. He’s doing tee and soft toss work in addition to throwing and running … Miguel Andujar (shoulder) played catch today for the first time since being shut down. Here’s video. As you can see, it was not the most intense throwing session. Twenty-five throws at 60 feet. Andujar said he felt better than expected, and he is tentatively scheduled to throw again Friday. He might even swing a bat that day as well … Gary Sanchez is out of the lineup with calf tightness. He first felt it following Monday’s game and the Yankees put him through some tests, which came back fine. They’re giving him two straight days off (tomorrow’s an off-day) as a precaution. Sanchez is available tonight. 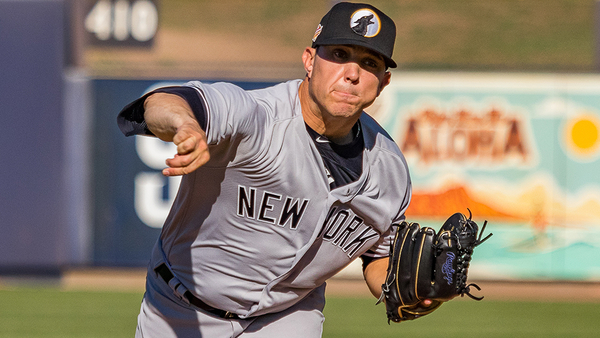 Roster Move: The Yankees optioned Jonathan Loaisiga to Triple-A Scranton following last night’s game and they called up right-hander Joe Harvey today, the team announced. It is Harvey’s first big league call-up. He is a short reliever, not someone who can soak up innings in long relief. I imagine Harvey is going back to Triple-A when Sabathia is activated Saturday. It’s pretty easy to predict how the Yankees are going to staff their bullpen this season. There are six players guaranteed a roster spot, barring injury. The team is planning to carry a 13 man pitching staff this year, meaning that there are two open spots assuming a five man starting rotation. Tommy Kahnle probably snags one of the two jobs considering he’s out of options. The last opening probably will be interchangeable throughout the season, though having a long reliever could be the outcome. There are no shortage of relievers who could ride the Scranton shuttle this season, rotating as the 13th pitcher as needed. Some of them are already on the 40-man, while others are non-roster invitees. It would be easy to write off any of the foregoing players as significant contributors, but let’s not forget that what Jonathan Holder did last year. He went from being the main back-and-forth guy to a major league bullpen staple. There usually isn’t too much to say about a September call-up who’s a reliever. Yet, Tarpley has become a pretty fascinating pitcher to follow. The Yankees probably envision him as Zack Britton-lite, and there’s good reason why. Prior to Britton joining the Yankees, Tarpley spent some time shadowing him prior to the 2017 season. Who knows if that story would have been uncovered had Britton not been traded to New York. Tarpley saw his groundball rate jump dramatically in 2017, almost certainly due to Britton’s influence. Combine that with the high strikeout rates in the high minors and you have an interesting relief prospect. Tarpley was pretty good in his 10 inning cameo last September and even made the playoff roster. He’ll probably get the bulk of the major league time that anyone else on the Scranton shuttle gets this summer. Tommy John surgery cost Heller all of 2018 and will curtail part of his 2019 as well. After going under the knife last April, he’s six weeks away rehab game action. That doesn’t mean he’s close to the big leagues, though. In all likelihood, he’s probably not an option until mid-season. The Yankees acquired Heller as part of the Andrew Miller trade a few years ago. He’s already seen small parts of two major league seasons with the Yankees, totaling 18 innings. Best known for his mid-to-high 90s fastball, it’ll be interesting to see how his velocity returns this summer. Even though he’s already had a good deal of success in Triple-A, he’s probably going to spend a lot of time there this year. Harvey was a somewhat surprising 40-man roster addition a few months ago. One of the reasons I profiled him in February was because I didn’t know anything about him. He’s still a bit of a mystery, though the Yankees clearly like him enough to save him a seat on the 40-man. A little bit has been made about the spin rate on his fastball. It’s very good, and spin rate has become all the rage in baseball these days. Just look at what the Astros have done with their pitchers. Anyway, Harvey doesn’t appear to have much else other than a good fastball. Yet, if he puts up numbers like he did in the minors last year (sub 2 ERA), he’ll get his shot this summer. As Mike wrote last month, it’s pretty easy to pull for Farquhar to carve out a role with the big club. It’s a distinct possibility that he could return to the majors after his near-death experience in the White Sox dugout last summer. As a non-roster invitee who’s already been sent to minor league camp, he’s still on the outside looking in. It’s not hard to see why the Yankees like him: he strikes out plenty of hitters and has had good seasons with Seattle and Tampa Bay. Plus, the Yankees have had him in the organization before, back in 2012. There’s still a lot for Farquhar to overcome, but if he resembles something of his old self he could be in pinstripes this year. Brothers is representative of the adage that lefties never run out of opportunities. The southpaw was pretty impressive for the Rockies early in his career with his high velocity fastball. Eventually, Colorado cut bait when his control evaded him. After not making the Cubs in 2016, he sat out the entire season. Beginning in 2017, he worked his way back to the big leagues with Atlanta. His walk problems never went away though, and he walked more than a batter per inning in the minors last year. Still, his velocity from the left side is tantalizing. He averaged over 96 MPH on his heater in limited time with Atlanta last season. He can’t be totally ignored as an option for the Yankees since he is in camp, but it would probably take a ton of injuries or an unlikely resurgence. Stylistically, Coulombe is the opposite of Brothers. Instead of a high-octane fastball, Coulombe is a lefty who relies on his slider and curveball two-thirds of the time. He’s been in the majors every year since 2014, split between the Dodgers and A’s, with middling results. It’s hard to see him as much more than emergency depth even though he’s hung around the highest level for a while now. Maybe another team will want to give him a big league chance before the month is over, but if not, he’ll hang around in Scranton most of the year. Maybe he could be plucked for September call-ups if the Yankees want a matchup lefty. Even though Stephan has been a starter in the minors, it sounds like 2017’s 3rd-rounder could be best deployed out of the bullpen. He works exclusively out of the stretch, doesn’t really have a third pitch just yet, and has a little bit of an odd delivery. Stephan’s a pretty big guy, standing at six-foot-four, but his fastball extension is even more impressive. He’s got a seven foot reach which certainly makes his fastball tougher to hit. He’ll be in the minors to start the year, but he should be knocking on the door by year end. 25-year-olds aren’t always prospects, but Lail became mildly interesting after moving to the bullpen last summer. From getting drafted in 2012 through his climb to Triple-A, the righty was a starter. Last year, he became a full-time reliever and started picking up more strikeouts. He wasn’t a one-and-done type of guy though; he pitched multiple innings quite a bit out of the pen. His ERA was too high, sitting over 5, but as a multi-inning option he could become an alternative to someone like Luis Cessa this season. Lail’s already been assigned to minor league camp, but he could be around later this year. I’m grouping these two together because Domenic called them out as guys who could help the Yankees this year. Espinal, 27, has been in the organization since 2013 and finally made Triple-A last year. He’s yet another hard-thrower with impressive strikeout rates. Diehl, 24, is a lefty without much of a platoon split thus far in his minor league career. He’s had a great spring (6 IP, 6 H, 2 R, 2 BB, 10 K) and Aaron Boone has mentioned him by name when asked who’s impressed in camp. Both are probably heading to Scranton to start the year, but either could become part of the shuttle in a few months. At six-foot-five and 270 pounds, Coshow has a presence on the mound. He flip-flopped between starting and relieving from 2013 through 2016 until becoming a reliever full-time in 2017. You’ve heard this story before: he started to miss a lot more bats in the bullpen. He’s likely low on the promotion pecking order, but the fact that he was in big league camp means the Yankees like him to some degree. Opening Day is less than three weeks away and the Yankees recently wrapped up their final little bit of offseason business. The Yankees have signed their 21 pre-arbitration-eligible players to one-year deals for 2019, reports the Associated Press. That’s everyone. The entire 40-man roster is under contract. As a reminder, players with less than three years of service time do not have arbitration rights. The team can pay them pretty much whatever they want, though they usually negotiate with the player and agree to a salary to maintain a good relationship. The Yankees agreed to deals with everyone this year and did not unilaterally renew anyone, which they did with Dellin Betances back in the day. Here, via the Associated Press, are the salary details. Because I like you, I’ve gone through the trouble of including each player’s year-to-year raise in parenthesis, assuming last year’s salary information is available. The Major League minimum rose from $545,000 last season to $555,000 this season. Unless the two sides agree to a long-term contract, all pre-arb players sign non-guaranteed one-year split contracts that pay them one salary in the big leagues and another in the minors. Non-guaranteed means the team can release the player in Spring Training and pay him only a fraction of his contract. I don’t expect that to happen with anyone though. I’m just saying. Most teams, including the Yankees, have a sliding salary scale based on service time for pre-arb players, with escalators for All-Star Games and awards voting, things like that. Minor league salary is determined by big league service time and tenure on the 40-man roster more than anything. This is Harvey’s first year on the 40-man. It’s Abreu’s and Estrada’s second and their minor league salaries are almost exactly double Harvey’s. The math is easy enough. It goes without saying many pre-arb players are grossly underpaid. Judge at less than $700,000 is one of the best bangs for the buck in baseball. Players make nothing early in their careers, and it used to be that teams made it up on the back end during free agency. That isn’t really the case anymore. The MLBPA should push for increased pay for players with 0-6 years of service time. I’m not sure increased spending on free agency is realistic in the analytics era. The Yankees have already signed Luis Severino and Aaron Hicks long-term this spring, and reports indicate they’re talking extensions with others as well. Impending free agents Dellin Betances and Didi Gregorius are presumably the top priorities. Judge and Sanchez are in their final dirt cheap pre-arb season, so I’d assume the Yankees will talk to them about an extension at some point. They might enjoy the huge six-figure production in 2019 first. Harvey, 27, grew up near Philadelphia and attended Kennedy-Kenrick Catholic School in Norristown, Pennsylvania. Prior to his senior year (2010), he was named to the Rawlings/Perfect Game Pre-Season Atlantic Region High School Senior second team. It was a nice honor, but by not being named to the first team, he wasn’t a draft prospect. So, it was off to the University of Pittsburgh. After redshirting in his freshman year, Harvey joined the Panthers’ bullpen. He was mediocre in his sophomore and junior years, but blossomed as a senior. After struggling with his control (35 walks in 60 innings), Harvey took a step forward in his senior season. Preceding his senior year, though, was a trip to the Cape Cod League, where Harvey threw six innings of one run ball. Though not enough exposure to make anyone really notice, it was a precursor for his final college season. Everything came together for Harvey in his last year at Pitt. Rather than pitch exclusively in relief, Harvey got most of his work as a starter. In 15 games (12 starts), the righty tossed 71 innings with a 2.90 ERA. His biggest improvement was his control: he walked only 16 batters, good for a BB/9 just north of 2. This performance got him to the very back end of Baseball America’s top 500 draft prospects in 2014. The Yankees popped him in the 19th round of the 2014 draft. Harvey signed for $60,000 and reported to rookie ball for a two-game tuneup before heading to Staten Island to finish his first pro season. From day one with the Yankees, Harvey was no longer a starter. His organizational debut was excellent (20.2 IP, 19 Ks, 5 BBs, 1.74 ERA). It was a solid beginning in advance of what was supposed to be his first full season in 2015. Unfortunately, Tommy John surgery changed things. After a couple of months in Charleston to start 2015, his season was over. Upon return, Harvey excelled. After a few rehab appearances in the GCL, he finished 2016 in Staten Island and recorded his highest strikeout rate (29.1%) of his young career. In 2017, he got off to a late start for reasons that are unclear (injury or extended spring training, most likely). Once back into game action, he dominated, this time with High-A Tampa. Around a short DL stint midseason, he recorded a microscopic 1.05 ERA and 29.3% strikeout rate. That winter, he was eligible for the Rule 5 Draft but the Yankees didn’t protect him. Despite the strong performance, Harvey was an afterthought at the time as a former 19th rounder with a recent Tommy John surgery, so there wasn’t much concern he’d be taken. No team selected Harvey in the Rule 5 Draft, as expected. He started 2018 with Double-A Trenton, but was promptly bumped up to Triple-A in late April for good. 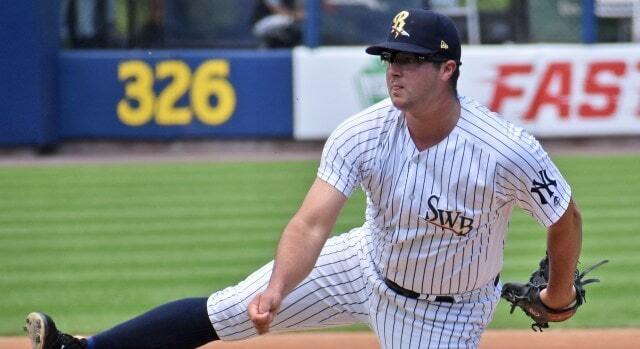 The righty became a key cog in Scranton’s bullpen and completed his first full professional season without interruption. In 59.1 innings last year, Harvey pitched to a 1.67 ERA while punching out 29.1% of hitters. In the Triple-A playoffs, he held opponents scoreless in four appearances. The Yankees added Harvey to the 40-man roster just a couple of weeks after season’s end. It was a somewhat surprising addition, but it’s hard to argue against his performance. Mike also noted that Harvey throws “something resembling a changeup”. Like so many relievers, control is not one of Harvey’s strengths. His career minor league walk rate of 10.7% won’t fly in the majors unless he’s the next Dellin Betances. 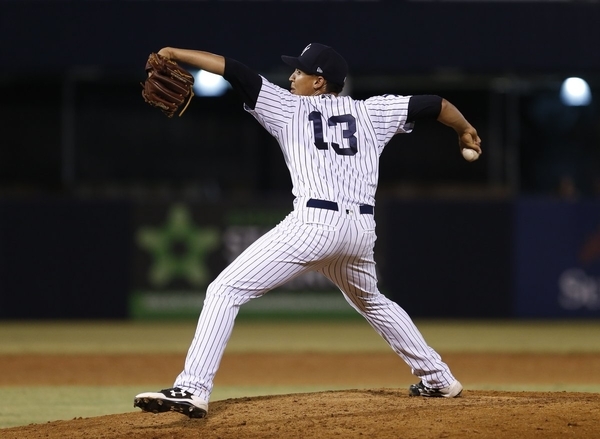 The odds of him being the next Betances are slim, to say the least.
? Harvey is a well built 6’2″ and 220 pounds. He has a little bit of a Tommy Kahnle look on the mound, who’s of similar stature (6’1″, 235 lbs). From a stuff perspective, he reminds me of Chad Green. That’s a lofty and certainly unfair comp, but their repertoires are quite similar. Both have high spin rates on their mid-90s heaters and have questionable breaking pitches. Projection systems don’t think much of Harvey at this point. PECOTA pegs him for a 5.26 ERA while Steamer is a bit more optimistic at 4.60. These poor forecasts aren’t a big deal though. Barring a plethora of injuries, Harvey isn’t going to have much of a role on this year’s big league squad given the Yankees’ current bullpen. Plus, Harvey will have to compete with other 40-man relievers likely destined for Scranton, such as Stephen Tarpley and Ben Heller. In all likelihood, Harvey will ride the Scranton shuttle back and forth a handful of times this season, rotating with the Hellers and Tarpleys of the world as needed. He should see some time during expanded rosters in September, too. Otherwise, he should be one of the RailRiders’ go-to late inning relievers. Harvey doesn’t excite me. 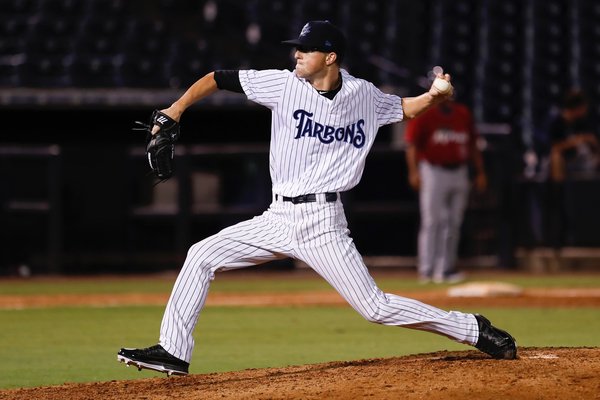 Despite his minor league track record, it seems like hard throwing right-handed relievers are a dime-a-dozen nowadays. If he had a wipeout slider or curve, it’d be a different story. He’s undoubtedly a nice depth arm that can be plucked from Triple-A as needed, but I would be surprised if he amounts to much more than a middle innings guy. Maybe he can ride his fastball to success in the way Green has, but that remains to be seen. Have we mentioned before that the Yankees are hoping to snag two relievers to fill the voids left by Zach Britton and David Robertson? I imagine so, but you can never be too sure. As of this writing, several of the higher-end bullpen options have signed – Jeurys Familia with the Mets, Joe Kelly with the Dodgers, Andrew Miller with the Cardinals, and Joakim Soria with the A’s – but there are still plenty of intriguing options out there (including the aforementioned Britton and Robertson). It’s way too early to worry about the Yankees missing out on a top reliever or two, but it’s never to soon to peruse the system and see what sort of help they may have waiting in the wings. So let’s take a look at four relievers that aren’t too far from the show.
? Diehl is a two-pitch reliever, working with a low-90s four-seamer and a low-80s slider, which he throws at about a 60/40 split. The slider, when it’s on, has excellent movement, and is a true swing and miss offering. As you can see from the video he throws from a three-quarters slot with a bit of crossfire, so he hides the ball fairly well, which makes the velocity play up a bit more. And it helps against righties, too. It’s not elite stuff, but he’s far from a junkballer. There’s a non-zero chance that Diehl could add some weight and some velocity, given that he’s 6’2″ and relatively slim, but it’s far from a guarantee. And, in the Yankees organization, that uptick in velocity tends to come sooner rather than later. With more velocity, he could be an serious asset in the bullpen. As-is, I think of him more as a middle reliever than a late innings type – and that’s just fine. Espinal is the old man on this list, having turned 27 a couple of months ago. 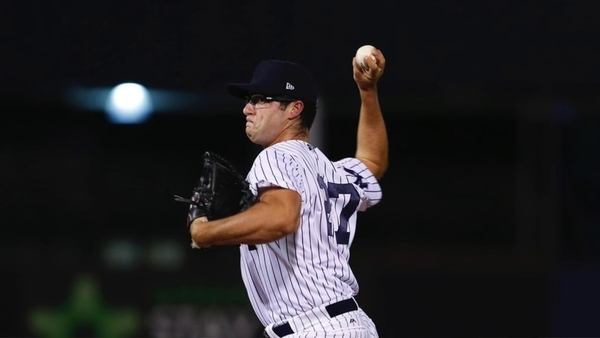 He has been in the Yankees organization since signing out of the Dominican Republic in 2013, posting a 3.04 ERA, 29.2 K%, and 6.8 BB% in five full seasons. The Yankees tried him out as a starter in 2016, but the results were ugly (4.63 ERA), and the experiment was scrapped thereafter. In terms of stuff, Espinal has the classic reliever profile with his low-to-mid 90s fastball and big-breaking mid-80s slider. Both pitches have big-time movement, and his 14.5% swinging strike rate was among the best at Triple-A last year. There are reports out there indicating that Espinal’s pure stuff is legitimately above-average, which would suggest that his ceiling may be a bit higher than the other arms on this list. However, his delivery is somewhat open, which removes any semblance of deception … which makes him the opposite of the aforementioned Diehl, in a way. Espinal is probably the most MLB-ready reliever that the Yankees have and, as he was invited to Spring Training last year, he might just have an inside track to the show in 2019. Harvey, 26, was the Yankees’ 19th round pick in 2014. He was a trusted late-inning reliever for Triple-A Scranton this past season, throwing 54.1 innings with a 1.66 ERA (2.49 FIP) with a very good strikeout rate (28.5%) and an okay walk rate (9.8%). He’s a mid-90s fastball guy with a curveball and something resembling a changeup. Classic reliever profile. Harvey probably isn’t an elite reliever, either, but he’s knocking on the door to the majors, and the Yankees clearly like him. If I had to pick one of these guys to spend most of the season in the Bronx, it’d certainly be him. The 25-year-old Wivinis was signed as a non-drafted free agent in October of 2016, after posting an excellent 1.59 ERA in 39.2 IP in the independent Frontier League. He was dominant in 2017 (0.88 ERA and 46 strikeouts in 30.2 IP) between Rookie Ball and Single-A, and that brilliance continued in 2018. He was quite good at this year’s Arizona Fall League, as well, posting a 1.50 ERA in 12 IP. It’s a short track record of success, to be sure – but his results have been outstanding.
? It’s not overwhelming stuff. However, it is worth noting that he’s another spin rate guy, with all of his pitches purportedly boasting above-average rates. With solid control and three pitches that move, it’s not too hard to see him being successful in a middle relief role. He might not be a stud, but there’s more here than meets the eye.